This afternoon I walked into my backyard and the smell of sweet, ripe peaches hung in the air and seemed to surround me. And a whole lot were hanging out on the ground too. Welcome Fall. 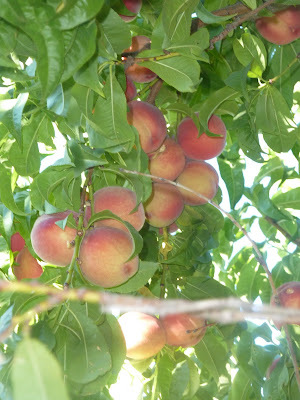 I'm not sure how many of these peaches will find their way down to my food storage room this year. Feel free to come over and share the harvest! I just might take you up on that offer! I would definitely take some off your hands if we were closer. WE LOVE peaches here! !